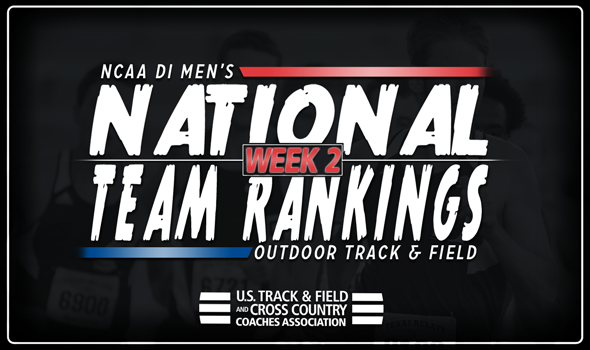 NEW ORLEANS – There were a few notable changes in the top-5 of the NCAA Division I Men’s Outdoor Track & Field National Team Rankings. Florida still headlines the most recent index released Monday by the U.S. Track & Field and Cross Country Coaches Association (USTFCCCA), but Texas Tech vaulted from No. 6 to No. 2 and Georgia climbed three spots from No. 7 to No. 4 to shake things up. The Red Raiders surged to their best outdoor rankings in program history following an eventful weekend at the Sun Angel Classic. It was in Tempe, Arizona, where Texas Tech’s 4×100 and 4×400 relay teams posted national top-8 marks and Vincent Crisp inched closer to the top of the USTFCCCA Individual Rankings in the 800. The Bulldogs made some noise at the Spec Towns Invitational this past weekend. Keenon Laine moved into the No. 2 spot on the USTFCCCA Individual Rankings in the high jump with a mark of 2.26m (7-5), while Darius Carbin is now 12th at 2.21m (7-3). Johannes Erm topped the 8000-point barrier in the decathlon and is ranked fifth in the Combined Event Individual Rankings with his total of 8020. If you’re wondering what happened to the rest of the top-5, Texas A&M fell to No. 3, while Houston (No. 3 to No. 5), Oregon (No. 4 to No. 6) and Southern California (No. 5 to No. 7) all dropped two spots. The Trojans did get a huge performance by Michael Norman, who clocked the fastest time in the nation over 200 meters this season so far (20.06). Further down in the rankings, Auburn, TCU and Kentucky jumped multiple spots. The Tigers went from No. 19 to No. 17, while the Horned Frogs went from No. 27 to No. 20 thanks to an NCAA-leading mark in the 400 by Derrick Mokaleng and the Wildcats went from No. 28 to No. 24 after Tim Duckworth took over the national lead in the decathlon. Business is about to pick up as April wears on and May gets closer, so you’ll want to check back weekly in advance of the 2018 NCAA Division I Outdoor Track & Field Championships, which will be held June 6-9 at Historic Hayward Field in Eugene, Oregon.